The battle royale genre received an unexpected new challenger from under the EA umbrella, but many eyes still remain transfixed on what DICE is planning to do with the wildly popular multiplayer mode. We're ever closer to the debut of Firestorm in Battlefield 5 and the developers have unleashed the first gameplay trailer. In the Firestorm trailer below, witness how the DICE team is infusing the battle royale multiplayer mode with the DNA of Battlefield 5, including destructible environments and a multitude of vehicles to pilot. The rollout for the Battlefield 5 take on battle royale, Firestorm, is fully underway as we get closer to the March 25 launch date. 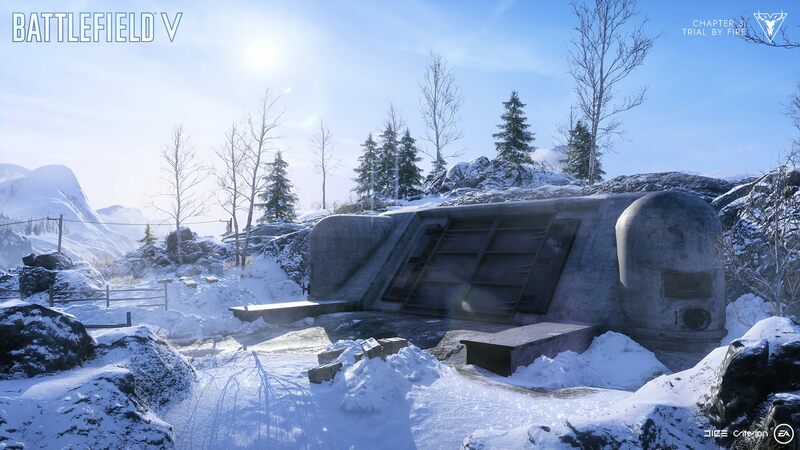 The mode will feature the largest Battlefield map ever, called Halvoy, and its10x larger than the game's previous largest map Hamada. Reddit user Milekill estimates that the map is 12km squared. That's pretty massive, especially considering the matches max out at 64-players, but there are elements of the Battlefield experience that make this make sense and could provide some additional unconsidered benefits as well. For one, Firestorm is bringing the most vehicles seen in a battle royale with 17 available. That'll make exploring the extra real estate much more doable, with players able to take vehicles on land, sea, and air. The blazing circle itself, which will narrow down the map and confine the living players, can also be used strategically by the developers. With such a large map, fights can start and finish in different areas to give the illusion of different battle royale maps. It depends on how things unfold with the initial drop into the match, of course. Battlefield 5 is available now on PC, PS4, and Xbox One. The Firestorm battle royale mode will be added to the game on March 25, 2019, via the Tides of War updates that bring free DLC content to all owners of Battlefield 5. If you own the game, no additional purchase is necessary to play Firestorm or any other new maps or modes. Stay tuned to Shacknews for additional gaming and tech updates.